Crown Realty Partners has acquired Pearson Corporate Centre in Etobicoke from a Bentall Kennedy fund for $63.5 million. “We’re quite excited about Pearson Corporate Centre, given its location within the airport employment zone,” said Crown investments partner Emily Hanna. “Any employer looking to be within proximity to its workforce would be enticed to this node, which has the largest concentration of employees aside from downtown Toronto. The 305,446-square-foot Pearson Corporate Centre is located on 9.7 acres that front Highway 27 at 10 and 20 Carlson Court. It consists of two mid-rise buildings, built in 1985 and 1989, respectively, which are connected by a central atrium. Crown will also be the property manager of the class-A complex, which was renovated early this year. 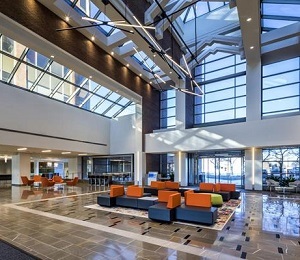 “With the recent renovations at the complex, including lobby renovations and the addition of an on-site café/restaurant, wellness centre and fully equipped fitness facility and town hall meeting space, Pearson Corporate Centre is truly a best-in-class office complex in the GTA West,” said Hanna. Those nearby amenities include a number of retail and restaurant options as well as hotels which offer additional meeting and conference space. Hanna said there are approximately 18 tenants in Pearson Corporate Centre, with Aecon Group Inc. and Tata Global Beverages being the largest. Crown will also market a full floor of approximately 15,000 square feet of traditional office space and 4,000 square feet of ground-floor space with direct access to the exterior. Pearson Corporate Centre recently achieved LEED Gold certification under the LEED 2009 Existing Buildings: Operations and Maintenance classification due to sustainable building initiatives and retrofits which improved energy and water efficiency performance. Indoor air quality standards are well-maintained and regularly tested, resulting in decreased employee absenteeism, according to Hanna. “It is certain that all these sustainability initiatives assist in attracting discerning tenants who wish to provide their employees with top-quality space. Crown intends to operate the building in a sustainable and efficient manner and will also enroll in energy efficiency programs, such as the Toronto Hydro OPsaver program,” Hanna said. Pearson Corporate Centre is the fourth acquisition made on behalf of Crown’s value-add fund, Crown Realty IV Limited Partnership, which has raised $234 million in equity and has $130 million remaining to purchase additional properties. Crown, which was founded in 2001, is an integrated investment and management firm that acquires, manages and develops commercial real estate assets in Canada. It has millions of square feet and billions of dollars of assets under management.